I’ve done a lot of hiking in Colorado. I’ve hiked all the 14’ers, and more than half the “Roach 13’ers” – the mountains between 13,800′ and 13,999′. I’m not going to describe any of these hikes because Gerry Roach describes them in tremendous detail in his two wonderful books. Colorado’s Thirteeners. Unfortunately this book seems to be out of print but if you can find a copy, buy it! Instead I’ll just describe a few hikes that I really enjoyed that are not mainstream hikes. 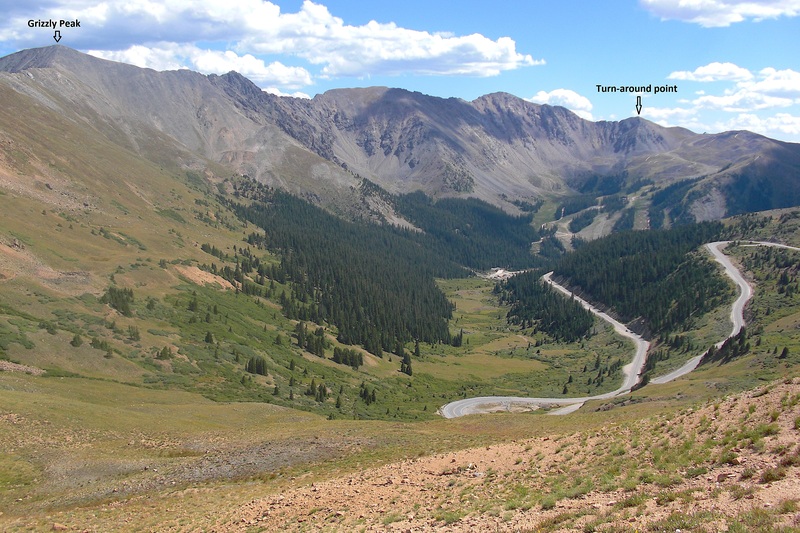 This is a great hike and scramble that traverses the long and beautiful rocky ridge above the A-Basin ski area. There’s a lot of exposure, and the scrambling is wonderful. Start at the parking area at the top of Loveland Pass. Hike east then south along the obvious trail, and after 2.7 miles of up-and-down you finally reach the top of Grizzly Peak. From here, head west along the beautiful rocky ridge. There’s lots of class 2 and class 3 scrambling, mainly along the top of the ridge. If you find yourself on anything harder than class 3, you are off-route. Keep going past Lenawee Mountain until the ridge peters out and you find yourself on easy slopes that lead down to the A-Basin ski area. At this point you have a choice. You can walk down to the ski area and hitchhike back to your car, or you can do as I did and go back the way you came. This way you get to do the beautiful ridge both ways 😀. 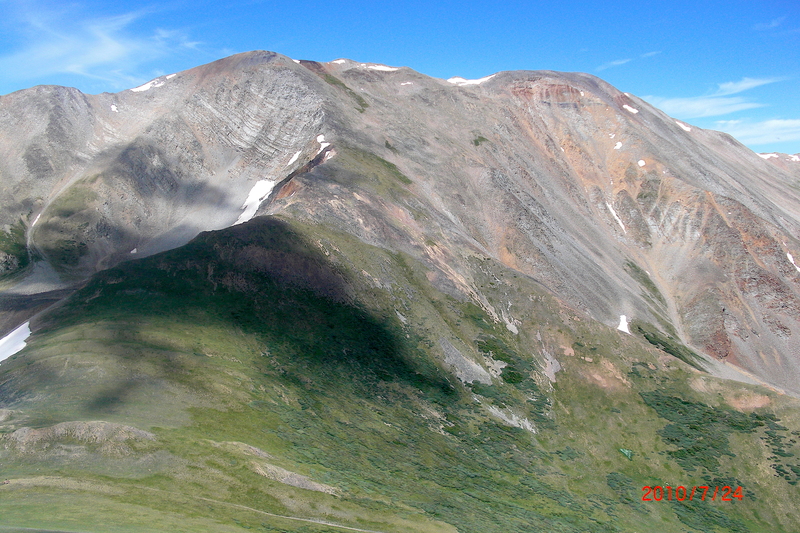 Note: From Grizzly Peak you can head east and climb Torreys Peak then Grays Peak. This is a tougher way to do these two 14’ers than the standard route, but it does avoid driving up the horrible dirt road to the normal trailhead. 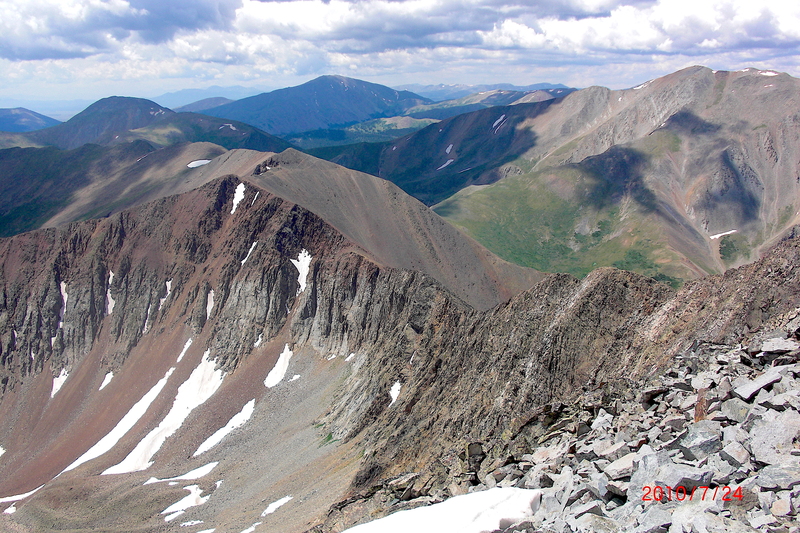 If you do both Torreys and Grays, the return trip can be intimidating. You will be tempted to avoid re-climbing Torreys by skirting round the mountain. 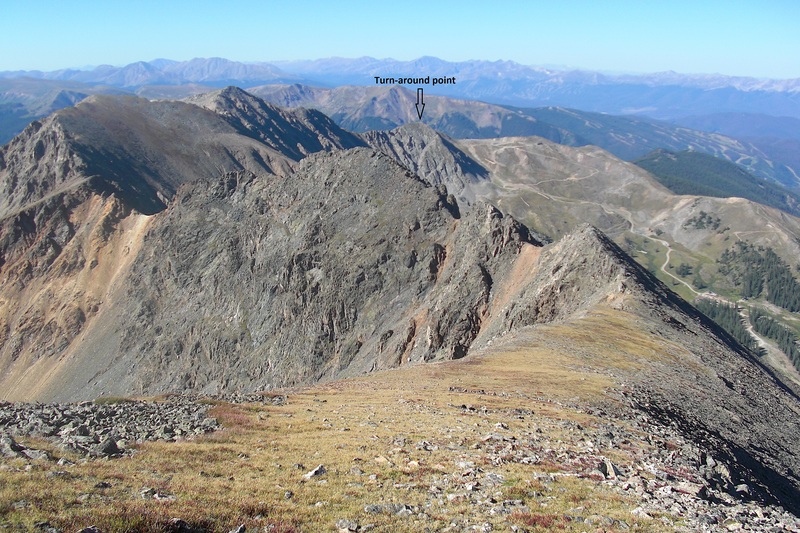 Unfortunately this is very rough and rocky and you are probably better off biting the bullet and going back up-and-over Torreys. A fantastic hike and scramble that dominates the view as you descend on I-70 from the Eisenhower Tunnel to Silverthorne. The hike takes you from Peak 1 above Frisco to Peak 10 above Breckenridge. Start at the Rainbow Lake trailhead in Frisco, near the intersection of 2nd Avenue and Belford St. Hike up the Mount Royal trail to the saddle between Mount Royal and Peak 1. Head south up the steep trail to Peak 1. The next few peaks require scrambling, sometimes in exposed positions, but once you reach Peak 4 you are back on easy ground. Peaks 4 through 9 are rounded and much easier, then just as you are getting tired you are faced with the much steeper climb up Peak 10. There’s a dirt road that heads up on the left side, but I chose to go the shorter way up the boulder field to the summit, although this can be covered in snow, depending on when you do the hike. After you reach the summit, hike down the dirt service road to Breckenridge, taking whatever shortcuts you like. Once in Breckenridge you can take the free bus back to Frisco then walk back to your car. 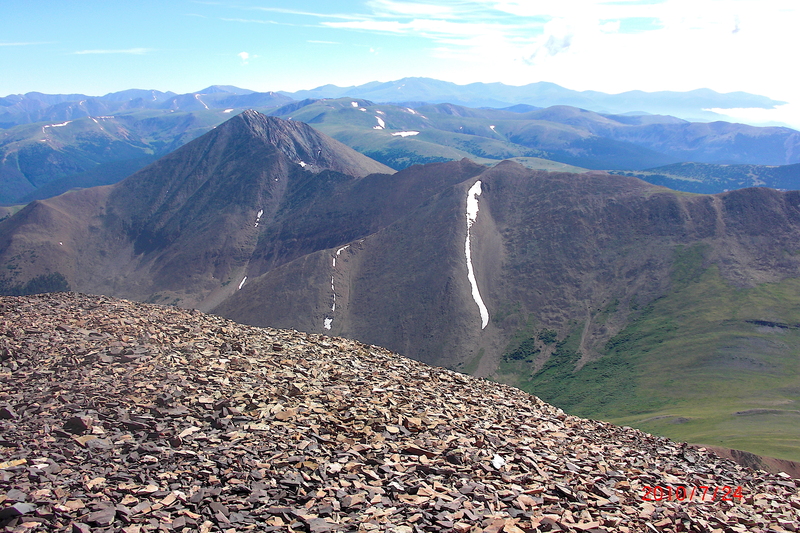 This is a wonderful and tough hike just south-east of Breckenridge. You can see the two mountains as you drive from Frisco to Breckenridge but the best view is from the Keystone ski area. Every time I’ve skied there I’ve thought it would be great to hike the two mountains, and I finally did it in July 2010. What an incredible hike. From Breckenridge, drive up French Gulch Road (County Road 2). You can get to this either up Huron and Reiling Roads, or up Wellington Road. Drive up French Gulch Road for a bit under 3 miles and park. Wander up onto the north ridge of Bald Mountain. This is a very long ridge and never seems to end, and the summit is far along, at the southern end. From Bald Mountain you can see the incredible south ridge of Mt Guyot rearing up to its summit. From the summit of Bald Mountain, drop down to the grassy area that separates the two mountains (French Pass), then pick your way up the easiest line to the other side. Follow the beautiful ridge up to the top of Mt Guyot. From the summit of Guyot drop down to the north. There is no defined trail (or if there is I didn’t find it), so just pick your way down the ridge and through the trees back to your car. 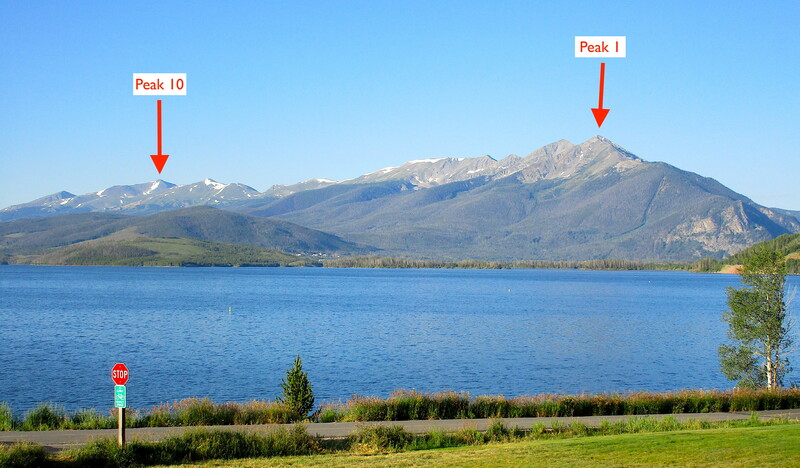 A great trip report about the traverse from Peak 1 to Peak 10.